Dr. Fontana, of Eye-35, does it all from comprehensive eye exams to treatment for pink eye and other infections. The annual exam he performs is for patients as young as 2 years old. During this exam, he will determine your updated glasses prescription and check the health of your eyes. He is experienced in co-managing LASIK,cataract surgery and many other retinal surgeries from day one post op. The doctor is also great at fitting contact lenses. He will check for disease or infection as well as treat dry eye during this exam. 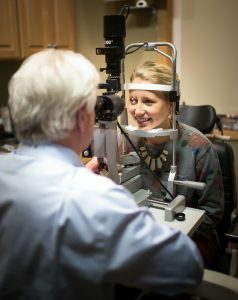 We offer FREE ocular surface (dry eye) evaluations with every eye exam. Early detection is very important when it comes to eye disease, especially glaucoma. With the latest technology, Dr. Fontana can diagnose and start a treatment plan on the spot, without need for a referral. Many people without eyeglasses feel they don’t need a regular eye exam because they have great vision. However, a significant percent of eye disease Dr. Fontana discovers is in patients who have 20/20 vision, don’t let your eyes fool you!